Born in Hebert, Saskatchewan, Wittman began a broadcasting career that spanned five decades in 1956 in Saskatoon. He signed on with CBC-TV in 1961. Wittman has been a play-by-play commentator for Hockey Night in Canada and has broadcast many Stanley Cup series. His career also included NHL All-Star Games, the 1987 Rendez-Vous Series, WHA games including two Avco Cup finals, international and World Junior hockey championships and several Olympic Winter Games. 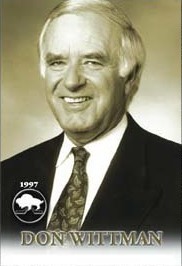 Don Wittman was also involved with CJOB radio coverage of the Winnipeg Jets in their final four years of existence. He was also named to the Manitoba Sportswriters and Sportscasters Media Roll of Honour.